Sunday was Valentine’s Day and just what my wife and Valentine wanted to do was to go out in 15 degree weather early on Sunday morning for a run. The weather forecast called for low temps (15 degrees) and snow. I’ve been wanting to get some hills in during a light snow and test drive my new Yak Traks—essentially tire chains for running shoes. I targeted the Roxborough State Park known for their picturesque rock formations and trails. Our dog “Munch” had to stay behind as there are no pets allowed as they are like Chipotle stuffed burritos for the mountain lions. On the subject of mountain lions—not the smartest thing I’ve done is running in an area known for these large cats. Note to self…invite a slower friend next time. I find out after the fact that in the newly remodeled visitor’s center, that had several lion sightings in the area with comments like…”dragging their kill.” NIIICCE! The work schedule called for a trip to the Bay Area on Tuesday so I checked the weather report and packed all the gear double-checking to make sure I had the Garmin and running shoes. With only one rest day a week, training does not take a vacation when I travel. One of the bucket list items I’d alre ady checked off was a run over the Golden Gate bridge in San Francisco—I’d actually run from the city over the bridge through Sausalito and into Tiburon. 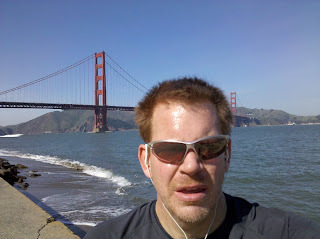 I’d finished that run with lunch in Tiburon (plenty of great options there) and took the Ferry back into the city. Since I misread my training schedule, my Tuesday (before I left Denver) track training turned into a 3/3/1 tempo run (three mile warm-up, three mile 10K pace, and one mile cool-down.) Since my travels sent me south in the Bay Area on Thursday, I figured I’d “flip-flop” tempo for track. I figured why not pick a nice track?..so I sought out Stanford’s Cobb Track and Angell Field in Palo Alto. Feeling dejected and inspired, I went about cranking out my six by 800’s on the Stanford Campus finishing outside the fence of Cobb Field. So I pulled the “hat trick” with three memorable runs in one week. Tonight is dinner in Palo Alto, tomorrow I fly home, hydrate and rest and finish the week with my longest training run of this training session with 22 miles with Runner’s Edge of the Rockies on Saturday morning. By the way, my 800 intervals averaged 6:33—take that Edreck!